Just as we have done for the last couple of weeks, we are covering albums by bands that won at the 6TH Annual Monster Entertainment Awards. We have already covered the album of the year (Post Pop Depression by Iggy Pop) and the rock album of the year (Gore by Deftones). So, it’s only natural that we move down the line to the next which is the metal album of the year which was taken home by Megadeth for their 15TH studio album Dystopia. In a way Dystopia was a return to form for Megadeth after lackluster sales plagued their previous album. The band had some new players for the album in Kiko Loureiro (Guitars) and Lamb Of God drummer Chris Adler (who recorded the record with the band, but is not a permanent member). 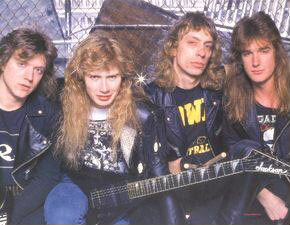 Together they joined Dave Mustaine (Lead Vocals/Guitars) and David Ellefson (Bass) in recording what was a huge step in the right direction as the album debuted at number three on the Billboard Top 200 charts making it the second highest charted album in the band’s history (Countdown To Extinction debuted at number two). The album also peaked in the top 5 in six other countries and the title track earned the band their first Grammy after 11 failed attempts for Best Metal Performance. My Final Thoughts– Sadly I do not know if Chris Adler will return to the fold for future albums, but this was truly an amazing record. It was definitely Megadeth moving in the right direction and they deserved the Grammy and the win here. Kiko Loureiro is an amazing edition to the band and I can not wait to here what else he brings to the table. I am giving the album 4.7 stars out of five for a final grade. As reported earlier in the week, former Megadeth drummer Nick Menza passed away while performing on stage. So as a tribute to him, I have decided to cover a Megadeth record for this week’s album of the week. The album I chose from his catalog is Countdown To Extinction, the band’s fifth album and the second to feature the classic lineup of Nick Menza (Drums), Marty Friedman (Guitars), Dave Mustaine (Vocals/Guitars), and David Ellefson (Bass). The album was a drastic change for the band in terms of sound because out were the fast as hell, face melting riffs and in were more intricate riffs and better song writing (at least in my opinion). The album was also a very trying time for the band as far as recording was concerned because curfew in Los Angeles at the time was 6PM due to the riots that followed the Rodney King beatings. The album was very successful for the band as it went two times platinum and peaked at number two on the Billboard Top 200 charts. The album was nominated for a Grammy for Best Metal Performance while the title track won he Humane Society’s Genesis Award for raising awareness for animal rights which is pretty cool. My Final Thoughts– Peace Sells is by far my favorite Megadeth record of all time, but this one falls close to number two. It’s definitely one of my favorites of the classic era besides Youthanasia. The classic lineup era was definitely the best era for Megadeth and this album solidified that. It’s an amazing album from the first guitar riff to the very last. It’s sad that Nick Menza passed away because I was hoping for him to rejoin Megadeth, but we know that was never going to happen. I am going to give this record 4.7 stars out of five for a final grade. March 11, 1983 might be a day that has absolutely no significance for some people in the world unless you are a true metal head. Some people may remember that on this day, Pakistan successfully conducted a cold test of a nuclear weapon or that Burt Reynolds, Jane Fonda & Katharine Hepburn won awards at the 9TH annual People’s Choice Award that year. For us metal heads, it was a different event that seemed insignificant at the time, but had some major effects in the music world. You see, Metallica traveled to New York to record a record, but when they got there, they gave Dave Mustaine his walking papers and Kirk Hammett walked in to the role of a lifetime as the new lead guitarist. It changed the course of history because Metallica went on to become the biggest metal band of all time releasing one hit record after another. Meanwhile, Dave Mustaine went home to Hollywood to an uncertain future, but once he got on his feet, he would start arguably the second or third (depending on your perspective) biggest band from the Thrash Metal scene in Megadeth after throwing a plant at David Ellefson’s air conditioning unit. Things were not all that shabby for Dave Mustaine who went on to create what I believe to be some of the most iconic records in Peace Sells… But Who’s Buying, Rust In Peace, Countdown To Extinction, etc. Brian Slagel of Metal Blade Records reflects on why he was let go, “Dave was an incredibly talented guy, but he also had an incredibly large problem with alcohol and drugs. He’d get wasted and become a real crazy person, a raging maniac, and the other guys just couldn’t deal with that after a while. I mean, they all drank of course, but Dave drank more…much more. 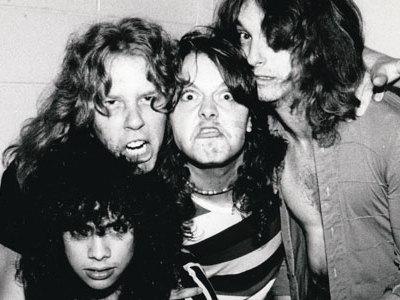 I could see they were beginning to get fed up of seeing Dave drunk out of his mind all the time.” The firing of Mustaine as I stated before drove the man to become the legend in his own right as his only goal was to prove that if Metallica could do it so couldn’t he and he wanted blood. 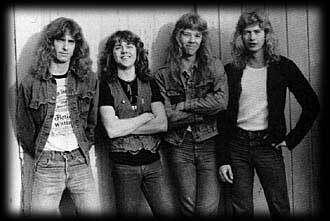 In 2009, James Hetfield commented on the situation saying that their reconciliation was needed because , “It’s obvious that he had the same drive as us — he went on to do great things in Megadeth. … He’s an amazing, talented person.” I for one have always thanked Metallica for kicking out Dave Mustaine because as he says in the Rock Icons episode that, “we wanted to be the up most heaviest, ultra furious metal band period. Doesn’t sound like my last band” and that is exactly what we all received. So forget the idea of being sad over a firing that happened 32 years ago and count the blessings while popping in So Far, So Good… So What into your stereo and bang those heads cause I know that I will.